A barking dog seldom bites. What does it mean? Well, first of all, it means that just because a dog barks and sounds scary, that doesn’t mean that he is going to bite anyone. To me, this seems like a good place to start – have students explain the literal meaning of the proverb. For proverbs that are stated in terms of an animal, start with the meaning of the proverb as it applies to that particular animal. There might be some words that need explanation, too. For instance, do all of your students know what “seldom” means? The next step is to apply the proverb to humans and to other situations. If we aren’t really talking just about dogs, what does this proverb mean? How would you apply the meaning to people? To understand proverbs, kids also need to know that not every bit of advice is a proverb. For instance, a straightforward statement like, “You should brush your teeth every morning,” isn’t a proverb. Even though it gives advice, it isn’t a saying that hasn’t been handed down, and it doesn’t need to be interpreted, or figured out, to make sense. The short story, “Under the Rug,” by Jon Scieszka (in The Chronicles of Harris Burdick by Chris Van Allsburg) would be a great addition to a set of resources for teaching proverbs or adages. In the story, there are several groups of three statements set off from the rest of the text. In each group, two of the statements are proverbs or adages, and one is an everyday statement. For example, the first set is: “Look before you leap. If the shoe fits, wear it. Sit up straight.” By discussing the differences between the first two statements and “Sit up straight,” students can really see what a proverb or adage is. There are several sets of statements like this in the story. 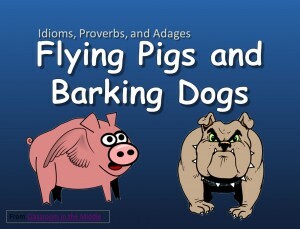 With many of the proverbs or adages in this story, students will also get a chance to practice with sayings that are not about animals. 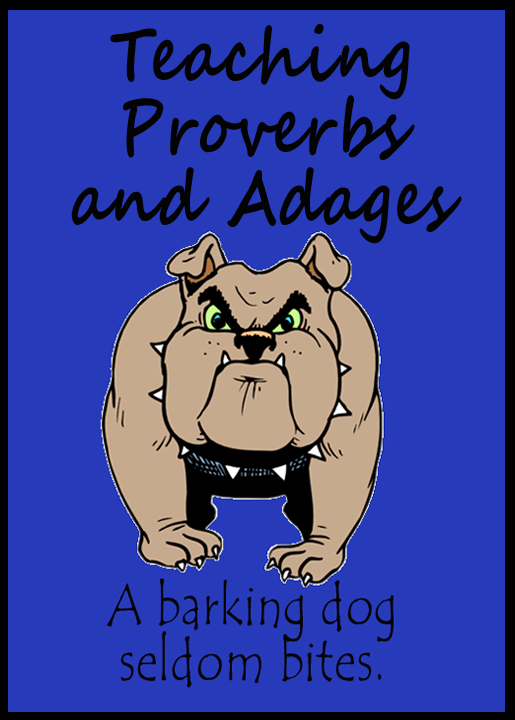 For animal proverbs, or course, Aesop’s Fables is the go-to resource. Each story is short and ends with a proverb that tells the moral of the story. 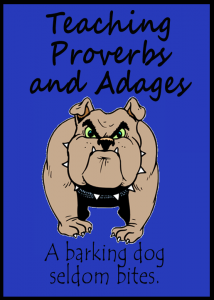 Some of the proverbs are easier to understand than others, so it’s worth it to take some time to browse through the fables to choose some that will suit your kids. A few that I have used with middle grade kids include: The Fox and the Crow, Belling the Cat, and The Town Mouse and the Country Mouse. Since these stories are in the public domain, it is very easy to find copies. Here is one source for Aesop’s Fables, from the Library of Congress. 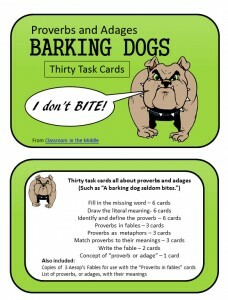 The resources in my Teachers Pay Teacher store for this topic include task cards and a PowerPoint presentation that introduces Proverbs, Adages, and Idioms.